Barbara DiLorenzo‘s debut picture book brings a piece of art history to life—quite literally. It’s a book decades in the making, and deeply influenced by the artist’s travels, family, and friendships. Explore with us the person, place, and thing behind Renato and the Lion. 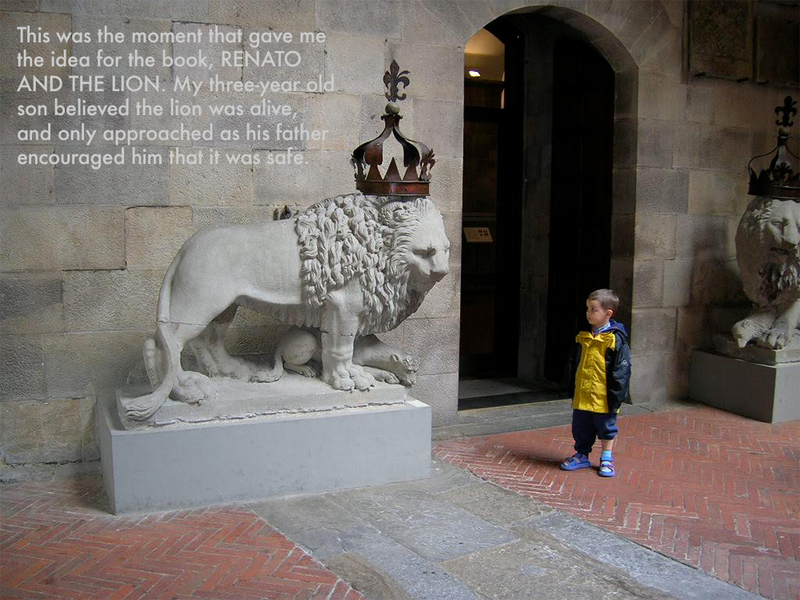 The idea for my debut book RENATO AND THE LION (Viking, 2017) began over a decade ago, on a family trip in 2006. We were visiting Italian family in Treviso, and decided to take a detour to Florence. Our three-year-old son was not amused by my constant push to visit the Florentine museums. However, when we visited the Bargello, a museum containing mostly sculptures, something magical happened. Near the courtyard where two white lions stand guard by a doorway, my little son wholeheartedly believed that one of them was alive. I watched through the lens of my camera as he reacted to the statue. He was scared, but his father encouraged him to approach the lion. His face showed concern as he stepped closer to the lion. After a few minutes, he bravely walked all the way up to the lion, and gave it a hug. (I know touching the sculptures is not a good practice, but in this case, a brief hug seemed magical). This interaction haunted me for some time, and I began to draw a boy character with a stone lion, come to life. Many years later, in 2015, I used my book advance for a research trip to Florence, Italy. I wasn’t always sure where my adventures would take me. On my way to the Piazza della Signoria one day, I noticed a small bookstore. In the window, I noticed a book about 1943 in Florence—something so specific that would help my research. I went inside, and started talking to the owner, an older gentleman named Enrico Rossi. I found an amazing guide, Antonia Lanza d’Ajeta, who agreed to help me translate for the interview. I took a photo of his storefront, and made a watercolor painting for him as a thank you. The interview itself went phenomenally well, thanks mostly to Enrico’s willingness to share stories, and Antonia’s gentle questions. I wrote notes furiously. He mentioned that his Jewish grandmother lived on the same street as the rest of the family, and it wasn’t a big deal. Italy treated its Jewish citizens very differently than other European countries. It wasn’t until Germany occupied the north after the fall of Mussolini in 1943, that the political winds changed, and people had to fear the Nazis directly. 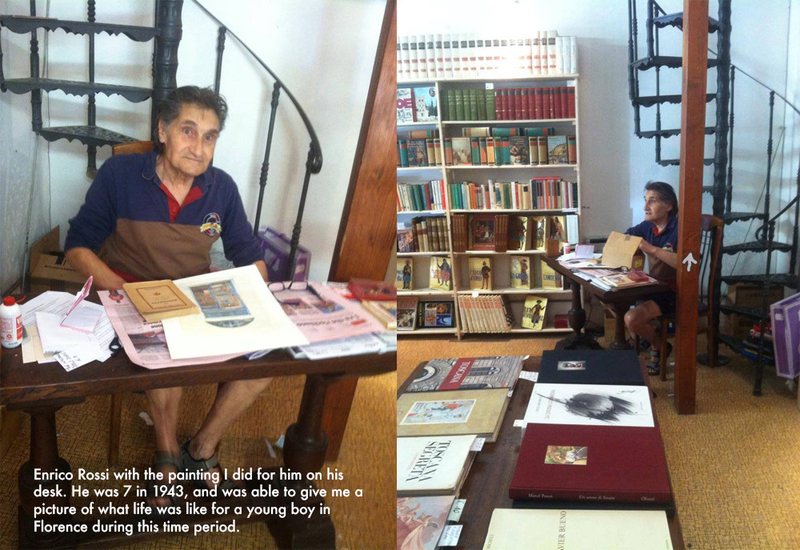 Enrico had shed light on what it was really like to be a young boy in 1943-44 in the old part of Florence. His stories stayed with me as I painted the final illustrations. I had visited Italy several times before I decided to place the story in Florence. But more than visiting Italy, being married to a first-generation Italian brought the family and culture close to me even on American soil. There was a warmth in the family bond that seemed strong—even when everyone was yelling around the dinner table. I loved how fiercely they had each other’s backs. It was a different experience than what I grew up with. When visiting cousins in Italy, I loved the everyday rituals that were different than mine. The tiny cups of espresso, the cleanliness of their kitchens, walking to absolutely everything. And of course the food. Even basic dishes tasted phenomenal. When making this book, I constantly thought about how Italians protected their people as well as their artwork. 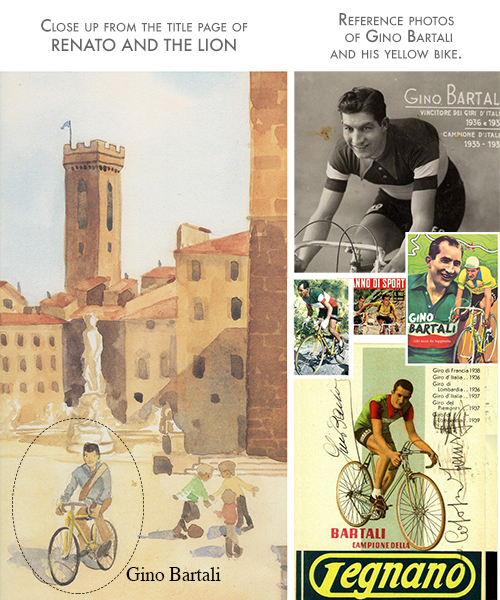 There is an Easter Egg on the title page: a portrait of Gino Bartali, a cyclist that was a hero to many in Italy for winning the Giro d’Italia in 1936 and 1937 as well as the Tour de France in 1938. But what folks may not know is that he worked directly with a priest and a rabbi to transport fake identification papers from town to town. He played a significant part in the Italian effort to protect Jewish refugees. Because he was regarded as a cycling hero, no one thought his long rides suspicious (after all, he was training), nor did they inspect his bike, where the papers were carefully hidden in the shaft. In 2013, he was posthumously recognized as a “Righteous Among the Nations” by Yad Vashem for his effort to help Jews in World War II. Although Florence—and Italy in general—is a beautiful setting for any story, it’s the heart of the people that drew me in. The original lion that my three-year-old son believed to be real, which sparked the idea for this book, was not the same one I used in the book. The original is a no-name lion in the Bargello Museum, a few blocks away. Rennie was initially quite fearful of the lion, pictured in the “Person” section above. 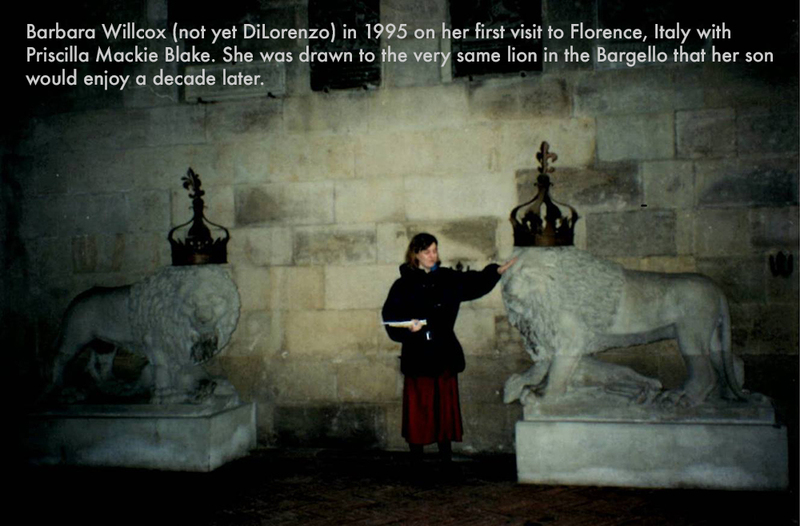 Interestingly, Priscilla Mackie Blake, who took me to Florence in 1995, snapped a photo of me interacting with the same lion—only a decade earlier. I thought long and hard about which lion I wanted to use for the book, and reasons to switch from the original kind-hearted lion in the Bargello. The first thing that came to mind was access. I wanted a public sculpture that any child could have access to without paying a fee. The second factor was how the protection of art would affect the story. In the Bargello Museum, I couldn’t find evidence that Rennie’s lion was protected or moved, but even so, it was partially protected within the walls of the museum. So for these reasons, I looked elsewhere. I settled on the lion facing the public square, the Piazza della Signoria. There are two lions guarding the steps to the Loggia Dei Lanzi, an outdoor sculpture park of sorts. This portico is filled with dynamic and beautiful sculptures. Most lions guarding doors or stairways come in identical pairs. But this set is different. The lion on the right is called the Ancient Lion, and is a bit degraded in detail due to his age (he was created in Roman times). In contrast, the lion on the left, created in 1598 by Flaminio Vacca, is in much better shape, and has an expressive, almost pained face. When I visited Florence for research, and sat by the lion sketching every night after dinner, I noted how tourists strongly gravitate toward this lion, and not the other. I think something in his eyes connects with people. 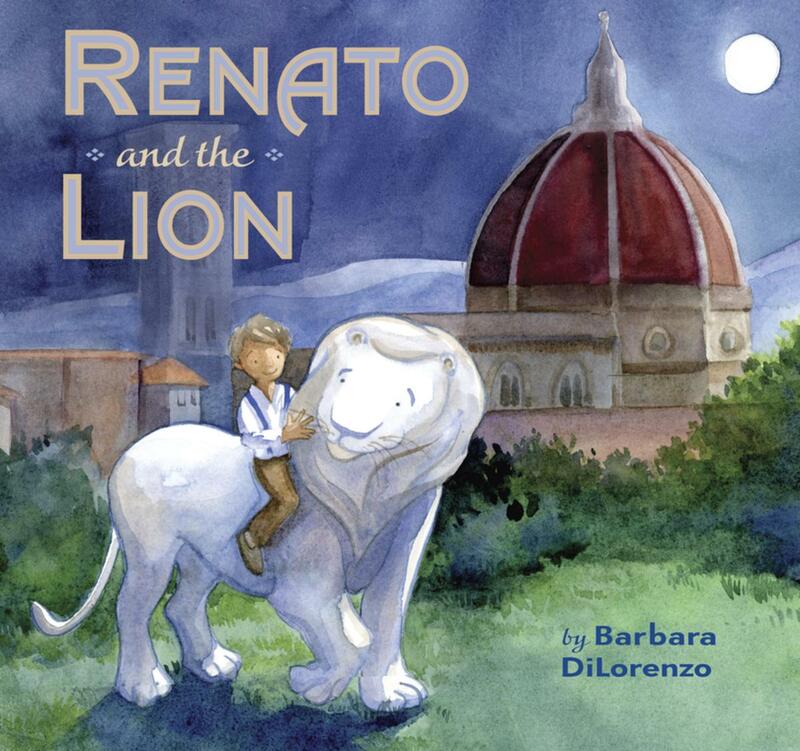 Barbara DiLorenzo is the author/illustrator of Renato and the Lion and Quincy. She received her BFA in illustration at the Rhode Island School of Design and studied painting at the Art Students League of New York under Mary Beth McKenzie. In 2014 she received the Dorothy Markinko Scholarship Award from the Rutgers University Council on Children’s Literature. She is a signature member in the New England Watercolor Society as well as the Society of Illustrators. Currently she teaches at the Arts Council of Princeton, and is co-president of the Children’s Book Illustrators Group of New York. Barbara is represented by Rachel Orr of the Prospect Agency. Outside of art and writing, Barbara has gone skydiving, hang gliding, and whitewater rafting. She loves to surf, and has driven across the U.S. with her son so he could earn Junior Ranger badges from various National Parks. She has traveled to Italy several times, and lived in Bolivia for six months during college in order to work in a school for the deaf. Currently, Barbara lives in Hopewell, New Jersey with her wonderful family–who constantly inspire new stories. 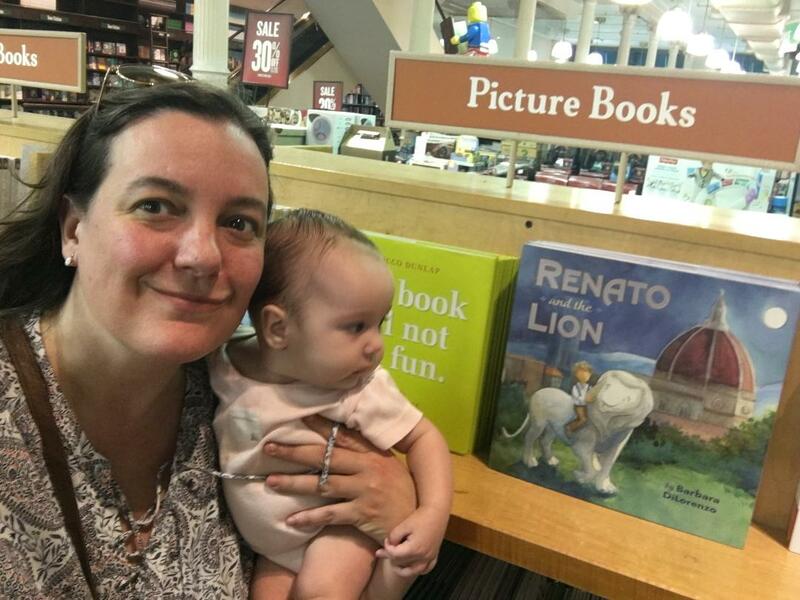 Her amazing 15-year-old son is the inspiration for many of her book ideas, including RENATO AND THE LION. More inspiration is on the way, as Barbara welcomed her second child, a daughter, in March 2017. She already seems to have a sense of humor—like her big brother.